The self-tuning guitar, complete with mechanically operated machine heads may sound brilliant, but is it? 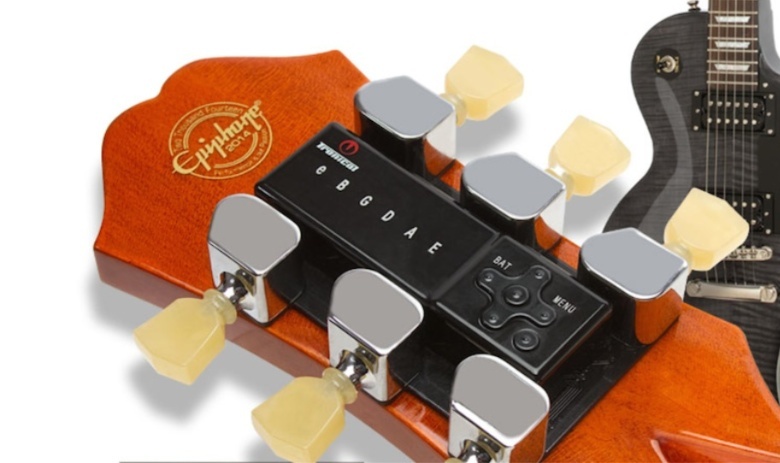 Epiphone has just announced the first two guitars to feature its Min-ETune self-tuning system. Despite the horribly clumsy name, it looks on first impressions like a great tool, particularly for beginners. The guitars, a Les Paul Classic-T and FT-350SCE acoustic, are billed as 'the world's first affordable' self-tuning guitars. The Les Paul spec would seem to be a good choice; similar to the Les Paul Studio and with an almost identical list price, it allows beginners to get the Min-ETune for not much more than the price of a Studio (assuming it is discounted similarly when it hits the market). The system itself is rather neat. It sits on the back of the headstock, between the machine heads, which it operates mechanically in order to wind the strings. To use it, you switch it on, select whether you want to tune the strings individually or as one (in which case you'll need to fine tune afterwards). There are six LEDs and when one lights during the tuning process, you pluck the corresponding string. The Min-ETune 'listens' to the note and then adjusts the tuning peg accordingly. Its default setting is standard tuning, but you can specify alternative tunings and the Min-ETune will re-tune the strings accordingly. Epiphone seems to have found a very clever way of tuning guitars automatically without adding any extra bulk or much extra weight to the guitar, and that's worthy of praise. Is the Min-ETune a good thing? Whether it's really necessary, or even desirable is another matter. Learning to tune a guitar by ear is all part of the experience of learning to play. Moe importantly, it helps develop the skill of listening to notes and getting a feel for how the strings sound relative to one another. Taking away the necessity to tune removes the opportunity to learn that skill. On the other hand, of course, devices for tuning guitars have been around for decades, even if they do require manual intervention when it comes to actually turning the peg. Who doesn't have a guitar tuning app on their smartphone? 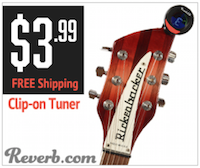 In that context, all Epiphone has done is remove the need to turn the machine heads. Is that a good thing or a bad thing? I confess, I still can't decide. Have a look at the video below and see what you think. Or, if you're looking for an motorised tuner that works with your smartphone, check out the Roadie.